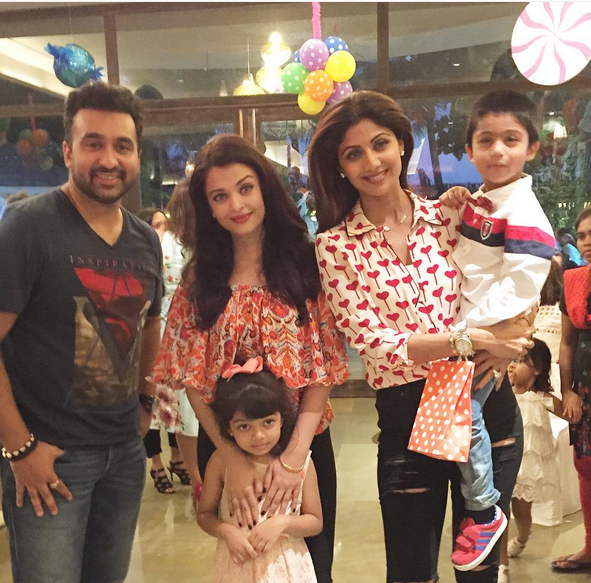 Aishwarya, Shilpa, Aaradhya Make it a Fun-Filled Celebration for Viaan’s 4th B’Day! On May 21, yummy mummy Shilpa Shetty and husband Raj Kundra celebrated their son Viaan’s fourth birthday. A very quirky and fun invite was sent out to every B-town celebrity and socialite with a tot at home, which read- “A sweet celebration is in store; our lil’ Candyman Viaan Raj is turning four! Join us in Candyland”. The guest list was comprised of R Madhavan with wife Sarita and son Vedant, aunt Shamita, grandparents Surendra and Sunanda Shetty, Aishwarya Rai Bachchan with daughter Aaradhya, Sanjay Dutt and Manyata’s twins, Shahraan and Iqra, Ayushmann Khurrana and Tahira Kashyap’s duo, and Riteish Deshmukh and Genelia D'Souza’s son Riaan. We are sure Viaan had an amazing fourth birthday!